﻿ Philippians 4:21 Greet every saint in Christ Jesus. The brethren who are with me greet you. 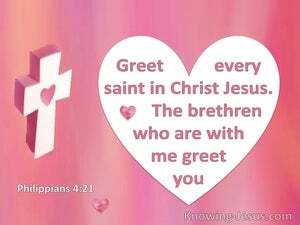 Greet every saint in Christ Jesus. Those brothers who are with me greet you. Greet every saint who is in union with the Messiah Jesus. The brothers who are with me send their greetings to you. Salute every sanctified man in Christ Jesus. The brothers with me salute you. Salute every saint in Christ Jesus. The brethren that are with me salute you. Remember me to every saint (every born-again believer) in Christ Jesus. The brethren (my associates) who are with me greet you. Greet every saint [i.e., God's holy person] in [fellowship with] Christ Jesus. The brothers who are with me [also] send their greetings to you. Salute all the christian converts. the brethren who are with me salute you. Salute every saint in Christ Jesus. The brethren who are with me salute you. Remember me to all my fellow-Christians. The brothers who are with me wish to be remembered to you. Amen. Salute every saint in Christ Jesus. The brethren who are with me salute you. Greet ye every one holy in Christ Jesus. The brethren with me greet you. 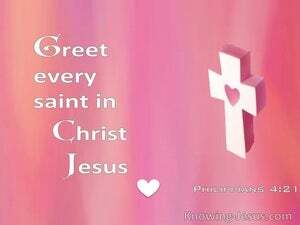 Greet every saint in Christ Jesus. The brothers with me greet you. Salute all the saints in Christ Jesus. The brethren which are with me greet you. Salute every saint in Christ Jesus. The brothers beside me salute you. Salute every saint in Christ Jesus. The brothers who are with me salute you. Give greetings to all the saints in Christ Jesus. The brothers with me here send greetings. Salute every saint in Christ Jesus. The brothers with me salute you. Salute ye every saint in Christ Jesus. The brethren who are with me, salute you. Give my greeting to every one of the People of Christ Jesus. The Brothers who are with me send your their greetings. Salute every saint in Christ Jesus. The brethren who are with me greet you. My Christian greetings to every one of God's people. The brethren who are with me send their greetings. Remember me to every one of God's people in union with Christ Jesus. The brothers who are with me wish to be remembered to you. 20 Now to our God and Father be the glory forever and ever. Amen. 21 Greet every saint in Christ Jesus. The brethren who are with me greet you. 22 All the saints greet you, especially those of Caesar's household.